Much as you were really. Three good strips, nah GREAT strips, two a bit mah BUT a slight untick in many and we're all okay. Dredd. Great ending to a really nice story. But the question remains who is that masked writer? Skip Tracer - has a good un. Nice fast paced action, but we still need to care more. 3riller - The Scorched Zone - "but we need to care more"... yep. This still happened. Fiends - Aerial bat creature fight. So now all you need to do is ask yourself is that enough for you to know this is GREAT? If not maybe 2000ad ain't for you any more! Pretty much all of the Brink bad guy's lines are great. I liked "Not out loud." What's is taking the place of the 3riller next prog? Do we know? That's a great cover, but I do wish they'd let Paul Marshall & Dylan Teague do a Skip Tracer one. 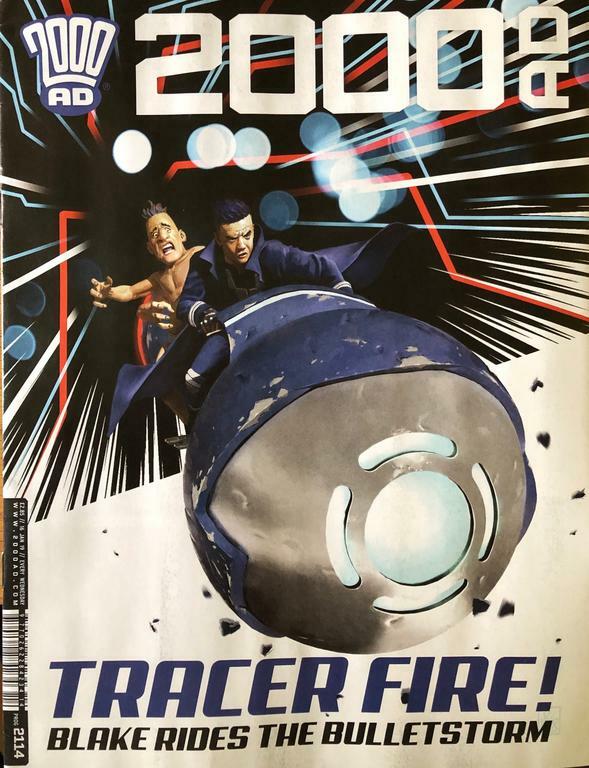 As Colin review says, this is much the same as the last issue, with the same highlights and same problems. The Dredd is enjoyable but I'd be amazed if the block buddies make another appearance, despite the ending. Fiends is good pulpy fun and Brink is, again, superb and the highlight of the prog. Some truly great lines in there. The 3riller ends without really going anywhere. Skip Tracer still doesn't work. At this stage I've given up on it. ^^^ this, oh and half a letters page, a zeriods pic, a NY joke in Damage Report and the promise of Wagner/MacNeil droid team up...nice! yes it is is superb and for me it is now edging out Lawless as the best thing from Tharg right now and indeed over the last few years. As to the greatest thing ever....its certainly up there, though whether it takes the crown...well that is a tough call and one that can probably only be made in retrospect. For me this has gone off the boil in the last couple of episodes and has not lived up to the promise of the opening episode. Another thing that took a dip for me this week was the 3riller; it seemed to throw in a load of fairly random ideas at end, many of which felt very familiar from stuff like the Walking Dead. Indeed I am now questioning the whole 3riller concept. A straight up one shot Future Shock seems a better format to me as it forces all the superfluous stuff to be trimmed and ironically many over the years seem to have more fully fleshed out characters than we get in 3rillers. I guess because it is necessary to focus on the core theme and have the characters' actions and dialogue support that. Dredd wasn't the greatest.It seemed to be done half way through this week's episode but carried on anyway to get to that final scene. I want a bit more than the build up final scene or punch line from my Dredd. So given all that, second place this week goes to Skip Tracer. Ok its not the most original thing we have seem but its ok, in a sort of mid eighties C list strip kind of way, plus it has art that far exceeds the script. Disagreeing with me is a healthy and often entirely sensible thing to do! Almost felt like Brink was treading water - at least by its own high standards - for a couple of episodes but CRIKEY! Can't imagine there being much competition for Best Thrill of 2019 now either. The prog feels just ok nothing spectacular even Brink I wanted the tell the "Villain" you talk to much. Come on guys let us see some fireworks. Dredd: Yeah, the Block Buds were a promising idea that kinda fizzled. I did like the twist and thought it was just about worth two episodes to get there. The idea of two huge holograms exposing themselves to each other was the best bit thing about it. Brink: Exquisite. A grandstanding episode for Joel Tillerson, tapped for maximum entertainment. "He was hurt" / "Only physically" was just glorious, as was the kiss. I see a few of the sect memes were kind of explained - Dan Abnett has said that they weren't just nonsense words, they all had a meaning, so this is good. Scorched Zone: ...because that would be a whole lot better than this. Fiends: Sorry, but this is lacking the fantastic folk-horror vibe of the previous chapter. Instead it's much more of a bog-standard 'evil villain' story. Bit of a let-down.